There is evidence of ice melt, sea level rise to +5–9 m, and extreme storms in the prior interglacial period that was less than 1◦C warmer than today. Human-made climate forcing is stronger and more rapid than paleo forcings, but much can be learned by combining insights from paleoclimate, climate modeling, and on-going observations. We argue that ice sheets in contact with the ocean are vulnerable to non-linear disin- tegration in response to ocean warming, and we posit that ice sheet mass loss can be approximated by a doubling time up to sea level rise of at least several meters. 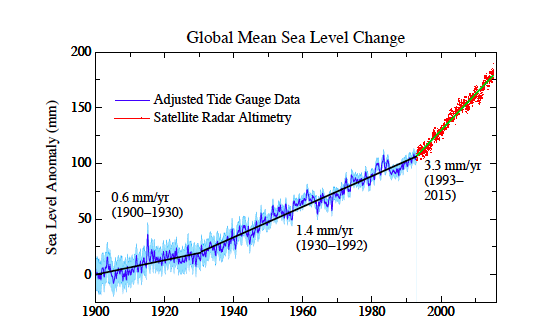 Dou- bling times of 10, 20 or 40 years yield sea level rise of several meters in 50, 100 or 10 200 years. Paleoclimate data reveal that subsurface ocean warming causes ice shelf melt and ice sheet discharge. Our climate model exposes amplifying feedbacks in the Southern Ocean that slow Antarctic bottom water formation and increase ocean tem- perature near ice shelf grounding lines, while cooling the surface ocean and increasing sea ice cover and water column stability. Ocean surface cooling, in the North Atlantic as well as the Southern Ocean, increases tropospheric horizontal temperature gradi- ents, eddy kinetic energy and baroclinicity, which drive more powerful storms. We focus attention on the Southern Ocean’s role in affecting atmospheric CO2 amount, which in turn is a tight control knob on global climate. The millennial (500–2000 year) time scale of deep ocean ventilation affects the time scale for natural CO2 change, thus the time scale for paleo global climate, ice sheet and sea level changes. This millennial carbon cycle time scale should not be misinterpreted as the ice sheet time scale for response to a rapid human-made climate forcing. Recent ice sheet melt rates have a doubling time near the lower end of the 10–40 year range. We conclude that 2 ◦C global warming above the preindustrial level, which would spur more ice shelf melt, is highly dangerous. Earth’s energy imbalance, which must be eliminated to stabilize climate, provides a crucial metric. Humanity is rapidly extracting and burning fossil fuels without full understanding of the consequences. Current assessments place emphasis on practical effects such as increasing extremes of heat waves, droughts, heavy rainfall, floods, and encroaching seas (IPCC, 2014; USNCA, 2014). These assessments and our recent study (Hansen et al., 2013a) conclude that there is an urgency to slow carbon dioxide (CO2) emis- sions, because the longevity of the carbon in the climate system (Archer, 2005) and persistence of the induced warming (Solomon et al., 2010) may lock in unavoidable highly undesirable consequences. Despite these warnings, global CO2 emissions continue to increase as fossil fuels remain the primary energy source. The argument is made that it is economically and morally responsible to continue fossil fuel use for the sake of raising living standards, with expectation that humanity can adapt to climate change and find ways to minimize effects via advanced technologies. We suggest that this viewpoint fails to appreciate the nature of the threat posed by ice sheet instability and sea level rise. If the ocean continues to accumulate heat and increase melting of marine-terminating ice shelves of Antarctica and Greenland, a point will be reached at which it is impossible to avoid large scale ice sheet disintegration with sea level rise of at least several meters. The economic and social cost of losing functionality of all coastal cities is practically incalculable. We suggest that a strate- gic approach relying on adaptation to such consequences is unacceptable to most of humanity, so it is important to understand this threat as soon as possible.